When it comes to interior design, many people find it easier to tell you what they don’t like rather than what they do like. Can you describe your own design style? Are you traditional? Modern? Contemporary? Classic? One reason it’s so difficult for us to pin down one particular style is that most of us, at least here in California, tend to gravitate toward a mix of styles. Seldom do I see (or design, for that matter) a room that’s 100% one way or another. Have a look at these kitchens and you’ll see what I mean. In each example, there is a blend of elements, materials and finishes, all fitting the personalities and lifestyles of the clients who own them. 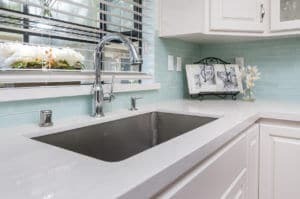 1 “Traditional” and “Classic” elements-- In some traditional and classic kitchens, you’ll find natural wood cabinets, and in others you’ll see painted cabinetry. Both types can fit into traditional décor. Painted cabinetry is often glazed or antiqued to give it more character, and wood finishes tend toward the dark, formal and dramatic. Color schemes tend toward neutrals like earth tones and black and white. Traditional kitchens often feature beautiful millwork, such as crown molding and embellished cabinets. Decorative corbels supporting breakfast bar countertops, and furniture-style toe kicks are definitely elements of a traditional kitchen. So are custom wood hood vent surrounds. 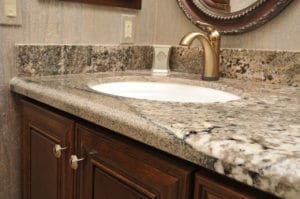 You might see farmhouse (also called apron-front) sinks, and elegant plumbing fixtures. 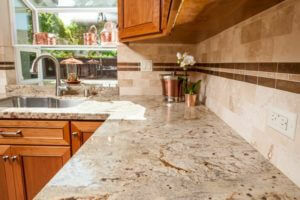 You’ll often see luxurious materials like marble tile backsplashes and natural stone counters. 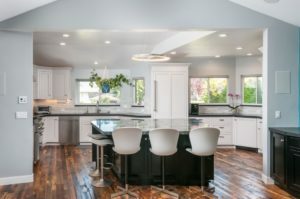 “Contemporary” and “Modern” elements-- Contemporary kitchens might also feature natural wood or painted cabinetry, but the door style is much simpler, less ornate, with cleaner lines. 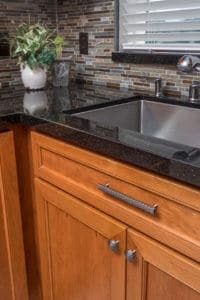 Very modern cabinets might have a high-gloss lacquered finish in white or black or a bold color like orange. 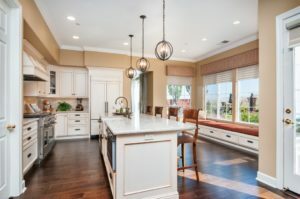 Shaker style or flat-front (also called slab) cabinetry is very popular for contemporary and modern kitchens, and in some kitchens, you’ll even see wood grain running horizontally rather than vertically. Mixing natural and man-made materials is also common. 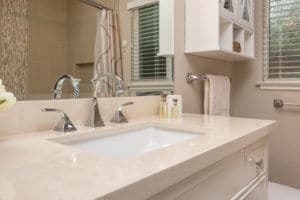 For example, you’ll see sleek quartz countertops paired with marble tile backsplashes, or granite counters combined with glass tile. Decorative light fixtures and pops of color are also characteristic of a contemporary kitchen. Faucets and sinks will be simple and unadorned, often stainless steel. Distressed wood floors and heavily textured stone backsplashes are two popular features you might see in today’s contemporary kitchens. A strategically selected rustic element can soften the look of a very modern kitchen and make it more casual and livable. For example, combining hand-scraped, distressed wood floors with sleek, crisp cabinetry creates an interesting juxtaposition, and also provides a practical walking surface for busy families with kids and pets. 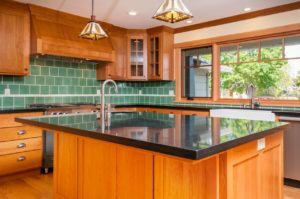 Unless the entire kitchen is designed intentionally as a rustic mountain cabin, the addition of one or two rustic elements does not make the kitchen any less contemporary. 1 All of this brings me to “transitional” design—a very popular term used today to describe a design style that I think most of us can relate to very well. 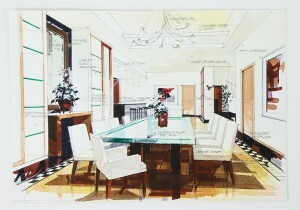 I define transitional design as a successful blend of both traditional and contemporary elements. I think that all of these kitchens shown can be described as transitional kitchens. Some may lean a bit more traditional or more contemporary, but none is a pure example of any one style. These days, unless you really know undoubtedly which style you prefer, chances are you’ll feel right at home in a transitional kitchen, blending elements of traditional, classic and contemporary styling.I recently went on a vacation to New England, where the fall foliage was magnificent. The beautiful oranges, reds and golds were truly a feast for the eyes. Let’s not underestimate California, however. In wine country, we have a fall foliage extravaganza of our own taking place right now. 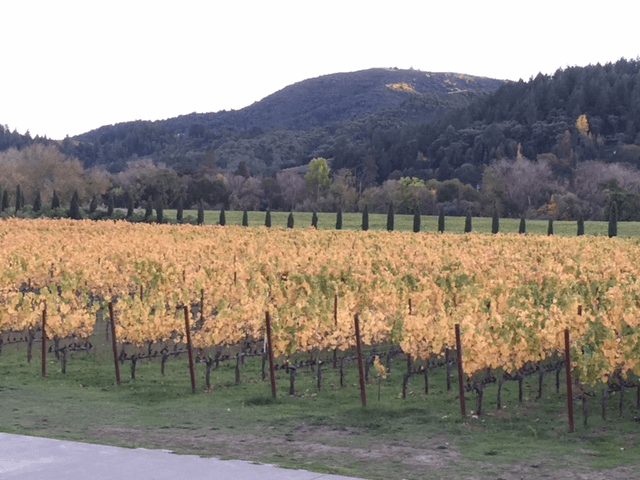 A weekend getaway to Healdsburg and Geyserville, featuring acres of golden-hued vineyards, was every bit as breathtaking as parts of New England. 1 1 Many of my clients prefer the warm, rich colors of autumn to cooler palettes of blues and grays. Those clients enjoy the warmth exuded by orange, red and gold. Warm colors tend to advance toward you in a room, so rooms decorated in a fall color palette feel cozy and comfortable—like a big hug. 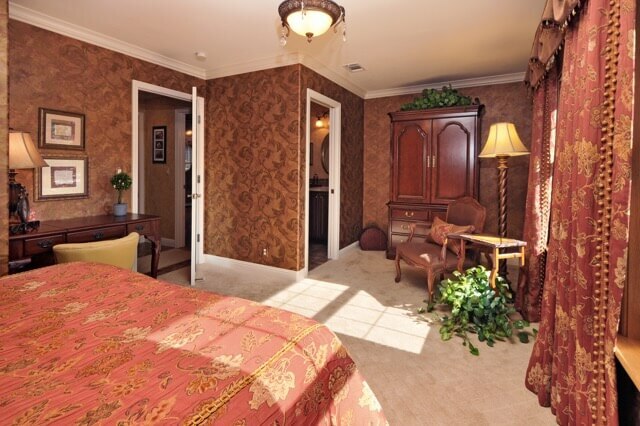 This guest bedroom is a great example of decorating in autumn colors. We chose a mostly monochromatic orangey-brown color scheme, with touches of gold and bronze finishes. The wallpaper on all the walls wraps the room in color, and the doors trim is painted in a contrasting, yet still warm-toned Navajo White. If you like the colors of autumn, you have many to choose from. Think of the seasonal fall produce for color inspiration: persimmons, pumpkins, butternut squash, red and green pears, sweet potatoes, pomegranates and golden and red beets. 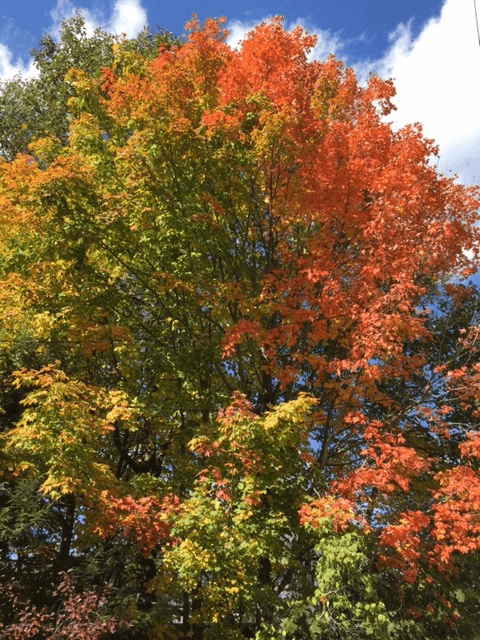 Notice the combination of leaves on the trees outside and pair your colors accordingly. Mother nature always gets it right. For a monochromatic color scheme, choose one main color and decorate with darker and lighter versions of that color. For example, in the bedroom photo, you’ll notice lighter and darker shades of orangey-browns and tans in the bedding, carpeting, wallpaper and the wood tones in the furniture. An analogous color scheme pairs colors next to each other on the color wheel. For example: yellow, orange and green. Imagine golden yellow walls, with an avocado or sage green sofa, and pillows in persimmon and pumpkin colors. A complementary scheme combines colors opposite each other on the color wheel. Red and green are classic examples of complementary colors. For an autumn color scheme, combine deep forest green with pomegranate red, or the rich burgundy of red wine. Add touches of gold in the light fixtures or pillows to round out this elegant look. In fall colors, your home will always exude coziness and warmth. Are you wishing for some color in your rooms without having to paint your walls? Try one or more of these tips to add an instant punch to your room. 1. Add artwork Many homes I visit have empty walls with no art, or artwork that is too small for their walls. Stores like Home Goods, Ross and Bed Bath and Beyond have affordable artwork in all sizes. Add a large canvas print in vibrant colors over your fireplace, or above the sofa, or in the dining room across from the china cabinet. If you have a mirror above your fireplace, replace it with some colorful artwork. Art.com is one of my favorite sites for framed art—the choices are endless! 2. Dress up your windows Blinds, shutters and shades are terrific for blocking light and providing privacy. But sometimes windows can look a bit naked. Here is where fabric can come into play. Adding decorative curtain panels to each side of a large window, or a valance to a kitchen window can really dress up those areas and add a lot of color and personality. I recently completed a master bedroom project where the clients already had white wood blinds on their windows. The wood blinds were just fine, but the room seemed a bit bare. I suggested custom stationary panels in a pewter color to blend with the bedding and new pillows. Their walls were painted in a light gray, and the darker tone of the fabric added texture and softness, as well as visual weight to the space. It was the perfect finishing touch. 3. Add pillows Since most people buy furniture in neutral colors, a great way to add vibrant color is by adding throw pillows. Pick up the colors in your artwork, area rug, or other upholstered furniture and your room will instantly have more personality. I love to pick my own fabrics and create custom pillows for clients, but I look for ready-made pillows whenever possible. 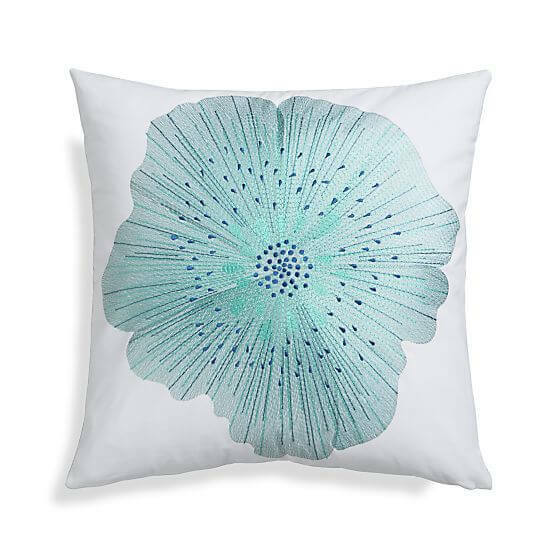 Try Pier One or Crate and Barrel for a great selection of colorful pillows. 4. Add a rug Even if you have carpeting, a large area rug can do wonders for a room. In my own living room, I bought a large 9x12 cream-colored area rug and laid it over my brown wall-to-wall carpeting. Even though it is not a vibrant color, it immediately lightened up the room and gave it a more polished look. In another recent bedroom project, red was our accent color, so we used golden tan paint on the walls, a cream coverlet with a red, green and gold paisley duvet, and a large beautiful red area rug. Without the rug, the room was pretty; with the rug, the room is gorgeous! 5. Reupholster a chair or bench Almost anything can be reupholstered. Dining chairs, a living room accent chair, an ottoman, a footstool, a headboard—you get the idea. 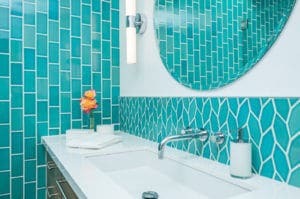 Take the opportunity to add beautiful vibrant color to wake up the room. For myself and for clients, I sometimes purchase inexpensive benches and ottomans at Homegoods or from Overstock.com, then select my own fabric and have them reupholstered. 6. Paint some furniture Do you have an old dresser, headboard, or end table that could use new life? Paint them in a vibrant color like red, or cobalt, black, or anything that strikes your fancy. A friend of mine purchased a small chest of drawers at a thrift shop and painted it gray. She uses it as a nightstand in her room with a navy accent wall and blue and gray paisley bedding. It looks great! For best results, hire a professional painter to spray the furniture instead of painting it with a brush. It will Look better, and have a longer-lasting finish that way. 7. Paint the inside of a bookcase You may have seen photos of this idea—instead of painting the whole bookcase, try painting just the back of it. The color provides a nice backdrop for the books and accessories that will go on the shelves. You can also use wallpaper instead of paint. 8. Dress up your bed Purchase a white, cream or light gray coverlet, then embellish the bed with a colorful duvet or comforter folded at the end of the bed. Finish it off with coordinating throw pillows and pillow shams. This is a great solution for someone who likes to change their bedding frequently, as pillows and duvet covers can be easily traded out for the seasons. 9. Choose colorful lamps This is a huge design trend right now. Have you seen the lamp bases in all the beautiful colors? Try lampsplus.com. 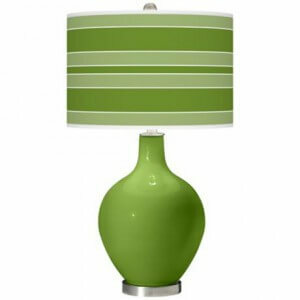 You can get lamps in dozens of colors, shapes and sizes, paired with solid color shades or patterned shades. Picture a dresser or console table, with a large mirror above it, and two matching lamps in a vibrant color like orange or turquoise. Instant fun! 10. Add accessories By accessories, I mean vases, dishes, bowls, trays, photo frames, even books with colorful jackets. How about a collection of blue, turquoise and green glass bottles in your kitchen garden window? Or a family photo collage all in glossy red frames? Or kitchen canisters and mixing bowls in lime green? A client of mine has a neutral kitchen, with a lime green KitchenAid mixer on her counter, a green tray on the table (holding napkins, salt and pepper), and green, orange and blue patterned dishtowels. It’s adorable! Purple is a wonderful color. It combines the passion of red with the tranquility of blue, and the result is beautifully multi-layered and unique. Color psychologists have determined that purple is the color of imagination and spirituality. Purple promotes harmony of the mind and spirit, and helps to balance thought and emotion. If purple is your favorite color, you are probably sensitive and compassionate, the person people come to when they need a friend and listening ear. You are probably also creative and unique, choosing home décor, clothing and hobbies that are unconventional. You are probably also quite spiritual, with an appreciation for the mysteries of the universe. Given this information, purple is a great color to use for interior design. Dark eggplant purple can look rich and elegant, especially paired with silver, gold and glass accents. Light purples can look playful and cheerful, especially paired with yellows, pinks, and lime greens. Dark purple also looks terrific paired with dark greens and oranges (think vineyards during fall harvest), and purple combined with red, magenta and bright orange is extremely energetic and fun. 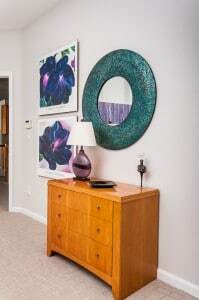 A recent design project involved a master bedroom, which the homeowner, a lovely, kind-hearted and creative person, wanted to decorate with her favorite color- purple. I designed the space using various shades of purple, accented with a vibrant teal, for contrast and energy. The drapery and cabinet hardware and finish on the bench are silver, and the walls were already painted a very light silvery color with lavender undertones. Small touches of teal (contrast piping on the purple satin comforter, one accent pillow, the beautiful mosaic mirror, and a glass vase) provide an unexpected splash of color. I mixed textures and materials in the space for added interest: the chair and ottoman are velvet, the bedding is shimmery satin, the bedside lamp bases are purple beveled glass. And the sheer curtain panels have a metallic threads running through the fabric for a tiny bit of bling. The result is a beautiful and luxurious bedroom retreat, a fitting place for my purple-loving clients. Is your dining room in need of a facelift? Whether your dining room is formal or informal, here are some decorating tips to help make it special.